We have multiple option -all for your own profit. Our Portfolio Managers work together in expert groups/investment teams. This ensures that each investment that is accepted into our investment universe is checked multiple times and examined all over – for your safety. We manage your assets “opportunistically”. This means the permanent scrutinizing of our strategy, while we do not insist on procedures which although efficient in the past, have outdated the current market situation. This is the only way how we can minimize our overall risk, because a “static” approach can easily fail to meet the intended objective. Our tailor-made solutions are in-house”conceived, implemented and controlled. Our aim is to realize opportunities for our customer portfolio and to prevent risks from taking over. Only then we will be able to propose asset investment to our Customers. Investments are dynamically adapted and optimized for both the static variables (see the Portfolio Browser below: investment amount, cashflow, risk) and the product composition (for ex. adjustment of the selected securities, etc.) – of course we place high value on transparency for our Customers and inform them on each decision. What is now the best mixture for me? 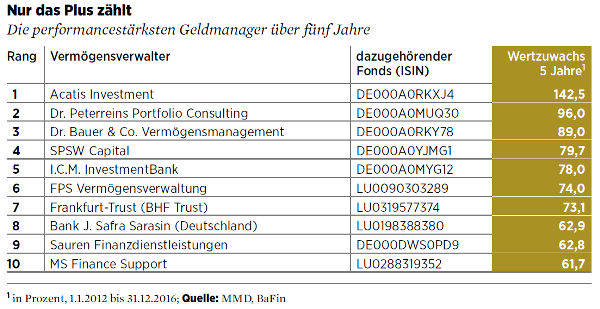 Our constant search for better strategies and solutions has paid off: In the magazine Wirtschaftswoche the ICM InvestmentBank AG ranks fifth among the best performing asset managers over a five-year period. By no means an excuse for us to rest on our laurels, but a stimulus to reach an even better performance for our Customers. With us you will find the unique combination of independent asset management and advanced technology for easy access, high transparency and maximum safety. Out of 216 investment options we will jointly determine a suitable investment strategy for your assets. You can decide yourself on the investment amount, payout and risk class and experiment which strategies and documents we use. Additionally, we offer detailed information and a minimum track record of 12 months. 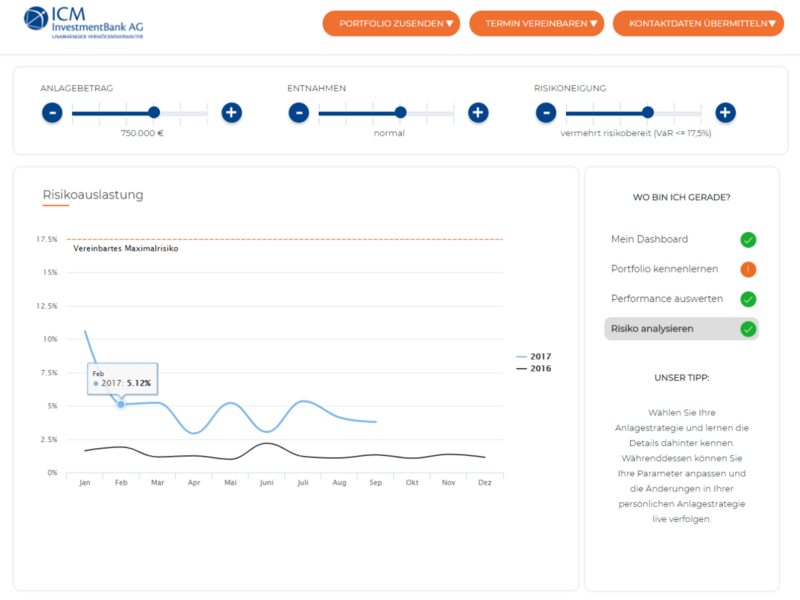 This way you can trace back the historical values on the performance and risk utilization in accordance with your filter positions. We will then send you an email with your personal investment mix. We offer you an active management – also for fixed-interest bonds, since long gone are the times when only a simple “security bond” was required for a custody account. We combine your information on the investment volume, risk budget and required cashflow with our expertise in countries, branches, companies and the distinct bond types in order to develop an individual bond portfolio, which is able to obtain revenues in the most different market conditions. 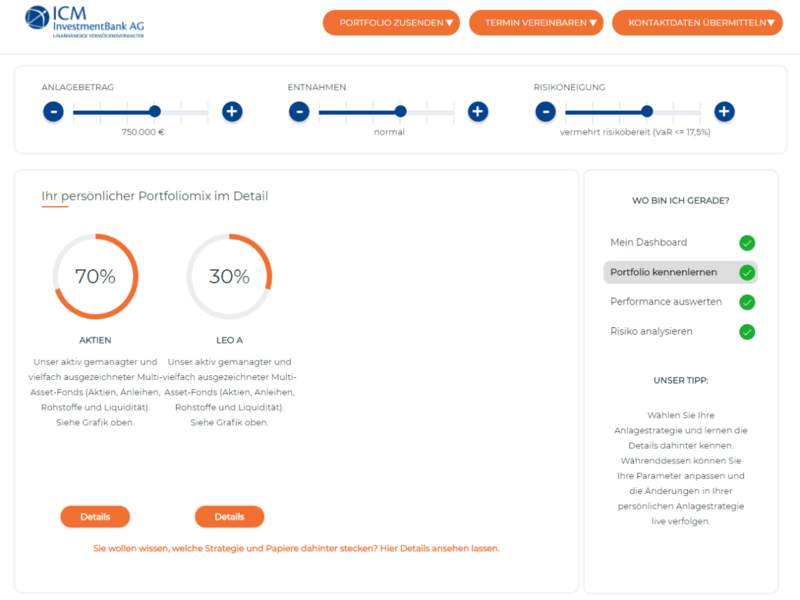 Our bonds portfolio has another advantage: We diversify our asset management into a series of bonds, because – different from other parties – we are not obliged to focus on minimum denominations. This is how we avoid cluster risks. 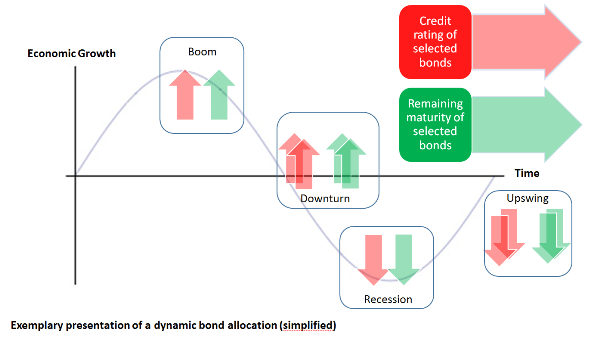 Which bonds support my strategy? Our ETF based equity fund portfolio was initiated in April 2008. The strategy focuses on the quantitative research by the Canadian Research company in Montreal. This complement our own approach and in-house analysis. 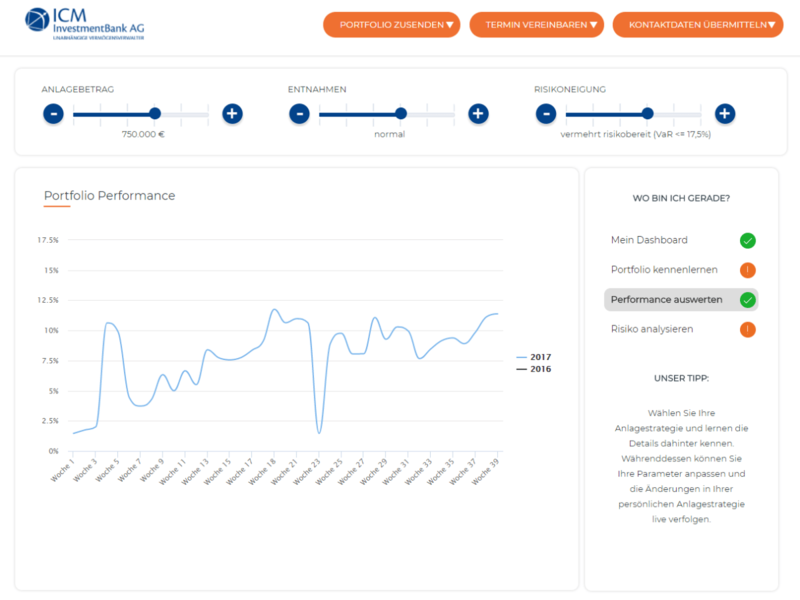 With low volatility and temporary hedgings we have obtained a 116.88% growth since the launch of the program. In the same period, the MSCI Welt benchmark index in Euro rose by 71.19 %. Our success is based on the permanent monitoring and constant adjustment in accordance with the market changes. All our asset managing investment funds are actively managed by us – with distinct strategies. Buy and hold is the rule, since the structure between and within the different asset classes is permanently adapted to the market situations and assessments. 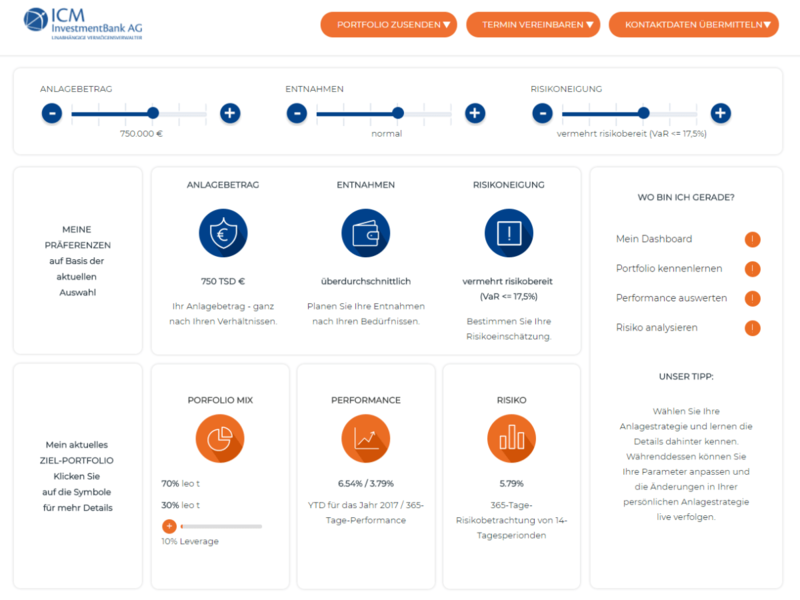 Do I need shares in my portfolio? Our internationally oriented share universe is continuously updated by our own investment team. 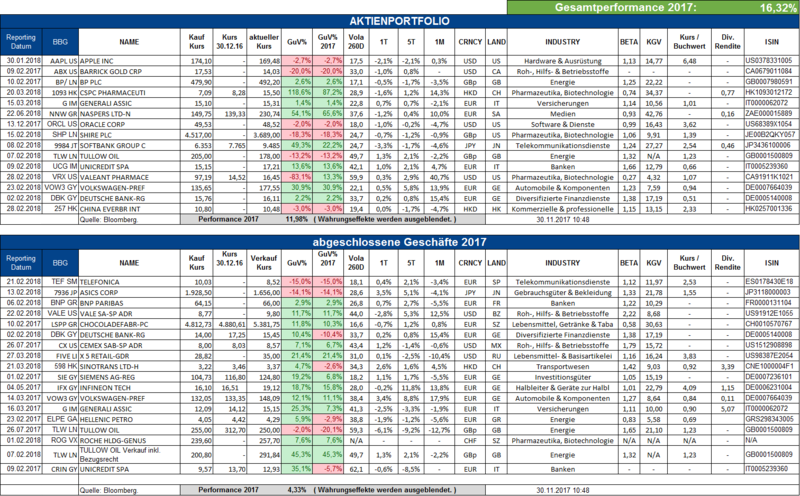 The 15 shares adopted into our Customer Portfolio are based on the premiss that they perform better than the rest of the peer group. The same applies to the supplementary implementation of stock options. This allows the timely adjustment to changing market conditions. Focusing on risk management has the priority over personalization. What do ICM alternatives offer you? Multidirectional long – short strategies in rising and falling markets.